Perhaps the most accurate time given for the event is 6:26 UT as given by amateur astronomer Paul Stewart from Timaru on New Zealand's South Island. Stewart captured the fireball on several all-sky images. A fine animation of his images is on his weblog. From the video's it is immediately clear that this is not a meteoric fireball, but the re-entry of an artificial object (i.e. artificial Space Junk). 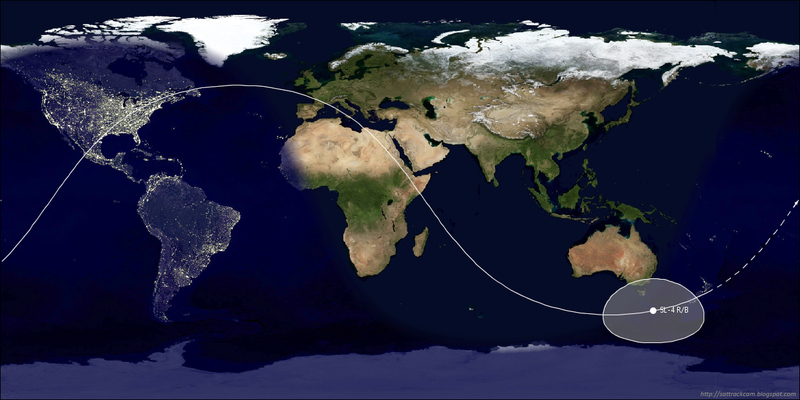 Time, direction of movement and geographical position moreover match well with an obvious decay candidate: the Russian Soyuz upper stage (2016-045B, NORAD #41671) from the July 16 launch of Progress MS-03 to the International Space Station. In other words: this was a Space Junk re-entry. At the moment of writing, the elements that are available for the Soyuz rocket stage are almost a day old and not unproblematic. For unknown reasons the B* drag value of the elsets is zero and the NDOT/2 value unrealistic. This hampers analysis slightly, but using the almost a day old elements face-value, the upper stage would have passed over New Zealand's Southern Island near ~6:33 UT (~18:33 local time). This is within minutes of the time of the New Zealand event. The direction of movement of the rocket stage also matches that in Paul Stewart's imagery. 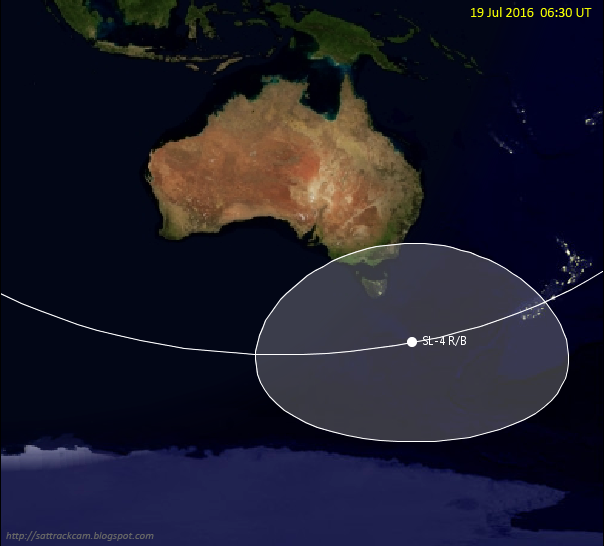 The maps below show the predicted position and track of the Soyuz upper stage for 19 July 2016, 16:30 UT (18:30 local time in New Zealand). They are based on the almost a day old element set 16200.42841345. The few minutes discrepancy between predictions and actual sighting from New Zealand is not unusual for a re-entering object. The last available elements (at the moment of writing) for the Soyuz stage are actually from many hours before the reentry, and during the last moments of its life the orbital altitude drops quickly (i.e. the orbit alters). Old elements hence will place it in a too high orbit compared to the reality of that moment. As it drops lower in orbital altitude, the rocket stage will get a shorter orbital period and hence appear somewhat earlier, "in front" of predictions made using the old element set. Discrepancies of a few minutes are therefore normal in cases like these. When it is "early" on the ephemerids, the orbital plane will be slightly more to the east as seen from a locality. In this case, the nominal pass predicted for Paul Stewart's locality would have been a zenith pass: but the a few minutes earlier pass time compared to the predicted time and the lower actual orbital altitude at the time of the re-entry would result in a sky track that is shifted eastwards and lower in the sky. This matches Paul Stewart's all-sky imagery.